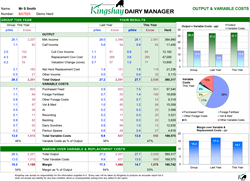 Analyse your costs of dairy production quarterly, 6 monthly or annually and benchmark your herd against the Kingshay group average. More details of the Premium Plus Package reports are shown below with examples. Also includes an example of the Input Forms showing typical data required. We can backdate 12 or 24 months of your information to give you the benefit of previous information on the reports. Suited to all types of farm - specialist dairy or mixed. 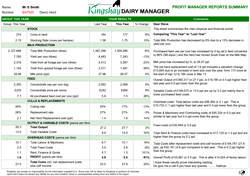 Developed to identify costs of production under any milking system. An example of the data required quarterly to complete the Premium Plus package. 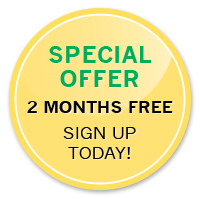 Also requires the monthly data from the Regular or Premium Input Form (e.g. 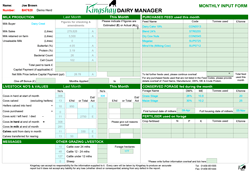 Milk Production, Cow/Calf Numbers & Values and Purchased Feed Use). 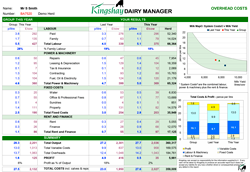 Calculate the full costs of milk production for your dairy herd(s), even on a mixed farm. Compare your costs to other progressive herds. Identify your strengths and weaknesses. Prioritise areas for action and make the changes. Quarterly updates help you to monitor and adjust.